Nutritionist approved. Source of protein and fibre. Never any artificial colours, flavours or preservatives. Suitable for vegetarians and vegans. We've given our popular flapjacks a protein upgrade, combining rich cocoa with whole rolled oats and mixed seeds. The result is this handmade pocket-sized pick-me-up! 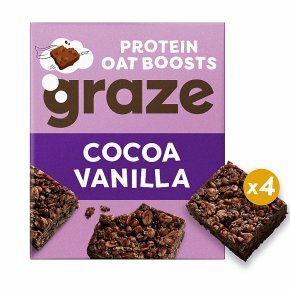 Made and packed by graze, here in the UK.